When I signed up for the Duke of Ed gold trip to Colombia, I didn’t know exactly what to expect. I knew that I would be completing a five-day hike, along with some service, all in order to reach my final goal of obtaining the Duke of Edinburgh Gold Award, but I honestly didn’t think that this trip would have much of an impact on my life. I now realize how wrong I was. This journey began in Bogotá, Colombia, where we spent two days in a poor community building houses for two very special families. The families were renting two small homes but they were having a hard time paying the rent. Both families had recently moved to the area in hope of building a better life for their sons. They explained that by having their own house they would no longer have to worry about paying their rent and would have a stable environment in which they could raise their children. Immediately after meeting these families and hearing their stories, we came to the realization that although building houses might only take us two days, it would change these families’ lives forever. With that in mind, we mustered up the strength and motivation to work as hard as we possibly could to get the houses finished on time. On the first day of service, we moved all of the extremely heavy materials needed off of a truck and down a dirt road to the construction site. Believe me when I say that this wasn’t easy. Some planks weighed over 100 pounds and there were significantly more than 100 planks to move. Through the pain and hard work, I kept telling myself that our work would change these families’ lives forever. Throughout the two days, the most incredible thing happened. Family, friends, and people from different parts of the community came to help us in the construction of the houses. Whether they were helping to transport the materials or even just coming out of their houses to offer us water or a place to use the toilet, the entire community was willing to help. This was one of the most special and touching things that I have seen in a very long time. It is rare that you see such genuine kindness from an entire community at once, and it was even more incredible to see this from a community that didn’t have much. In addition, the families cooked a meal for us both days that we were there in order to show their gratitude and appreciation for what we were doing for them. Once again, I was moved by how these people were willing to give everything that they possibly could to thank us. The strong sense of community was incredible and so beautiful to see and be a part of. Although we were not able to fully communicate with the families, as they only spoke Spanish, words were not needed for them to express how much all of this meant to them and how important it really was. It was in the moment where we handed these families the keys to their new houses that we knew for sure that all of our work really was worth it. As they unlocked their houses for the first time and thanked us for making their dreams of having somewhere to raise their children come true, tears of joy ran down their faces and they were overwhelmed with gratitude. As I was hugging the families goodbye, one of the children ran up to me and jumped into my arms, giving me the biggest hug and a kiss on the cheek. I will never forget that moment because this helped me realize the impact that I was going to have on this child’s life and future. These families’ lives have now been changed forever and it warms my heart knowing that they can now have a better quality of life and raise their children the way they’d like. This was an incredibly touching and memorable experience that has taught me that even the smallest actions make a big difference. It is so important to be aware of the impact that you can have and take advantage of every opportunity to help others out. Being one of the most non-athletic people to ever attend LCC, I was extremely nervous about the hiking component of this trip. 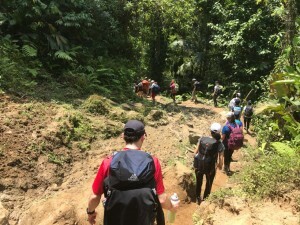 The hike began in El Mamey and from there, over the next five days, we made our way to the Lost City, better known as La Ciudad Perdida. I wasn’t wrong to be nervous about the hike, as it was quite difficult, but it was much more amazing than I ever could have imagined it to be. I was expecting to hike up and hopefully be able to hike back down, but I got much more than just that. From this five-day journey, I was able to make special bonds with some of the most unique people in my grade, and I learned so many life lessons that I will carry with me forever. When you are in the woods with a small group of people for five days, with nothing but your thoughts and a hiking bag, it is hard to have any boundaries at all. From day one, we had no choice but to let go of any inhibitions and be completely honest and open with the people around us. 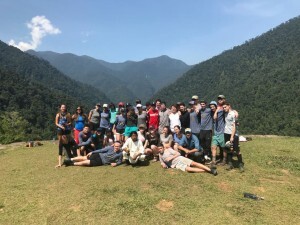 Personally, I was not able to hike without talking to someone and that was such a gift because it allowed me to form special relationships with all of the incredible people that were on the trip. I spent those five days sharing stories from my life and listening to everyone else’s stories as well. We spoke about our beliefs, our fears, our dreams, and everything in between. Having nothing but each other at the best times and worst times on the hike is what set the foundation for these bonds. I am sincerely hoping that we won’t lose these friendships when we get back home and back into the rhythm of our every day lives. Not having our phones for the five days is the main reason that we were able to create such pure and genuine connections with each other. In addition to this, not having my phone allowed me to appreciate the nature and beautiful world around me. It’s so easy to get consumed by your little rectangular screen without even realizing what is going on. It is so important to put down that screen and appreciate everything going on around you. Whether it is around nature or simply just to the person sitting next to you, look up once in a while and pay attention to what’s going on. Have a conversation with a real person face to face and create a real connection with a human being or go outside and take a walk and enjoy the beautiful world that we all live in. As cliché as it may sound, this journey really taught me to believe in myself. It was amazing to see what I could do when I believed in myself and really set my mind to it. At the moments when I was thinking that I couldn’t do it, my body really did start slowing down, and I found myself at my weakest point. It was only once I was able to escape that mindset and start to think that I could do it, that I was able to regain my strength and keep going full force. I found the things that I could do when I believed in myself surprising and amazing and that is something that we all must apply to our lives every day. You can do anything that you set your mind to, as long as you don’t give up, and I was able to learn and experience that first-hand on this trip. 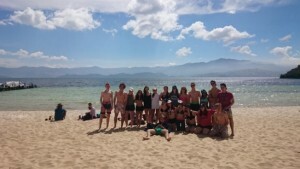 Duke of Ed Gold Trip Colombia: Unforgettable! There is just way too much to say about this trip to Colombia. I think that I speak for everyone when I say that we came back as better people. Colombia impacted us all from the moment we landed in Bogotá. The difference in culture was apparent. Taking the bus from the airport made us all realize how differently people from Bogotá live in comparison to us. There were people living under bridges with tarps as roofs. For many of us, this was an unfamiliar site in our own country or any other places that we had visited before. One of the most life-changing experiences was building a home for a family. 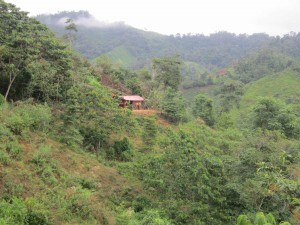 We had to travel almost three hours through slums and mountains to reach the Colombian countryside. 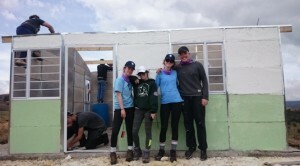 We spent two days building a house with the help of the family. There were points where some people couldn’t help, so they found other ways to contribute to the community. They played with the children and even helped translate. By far the most moving moment was handing the keys to the family and seeing them tear up with happiness. The next big thing was hiking the páramo. The four-day hike was a challenge for all of us, but in the end, we all felt a sense of achievement. But by far the most amazing feeling was when a few of us took on the extra challenge and climbed the Eagles Peak, which was 4,150 metres above sea level. We actually saw an eagle! The day started with an early wake up at 7 am at the Camino Real in Tota. The view to the lake from our window was beautiful. After breakfast we headed to the beach. The drive was about 45 minutes. When we arrived we put our belongings down and as a group collected garbage in the sand. Many of us found wrappers left by people who had visited the beach. Once we were done with our cleanup, we started a relay race. We all had a lot of fun and had to work together to win. After the relay race we had free time. A few people swam but many people just lay in the sand and tanned. Even though many of us applied sunscreen we still burned. The Colombian sun is much stronger than what we are used to in Canada and we all experienced its effects. We had lunch at the restaurant on the beach. Almost everyone ate rainbow trout, which was a regional specialty. After the beach we drove three hours to Villa de Levya. This was a very touristy town. It had the biggest town square in South America surrounded by many shops and restaurants. After visiting the town, we walked back to the hotel where we enjoyed a chicken dinner.